It's no secret that my blogging has fallen off. There are a number of reasons for this, but one of them has been that I start some train of thought or down some research rabbit hole, and just never get around to finishing a post to my liking ... then things move on. This post is such a one. Unfortunately Blogger doesn't date drafts (or I didn't note it before I opened the draft with edit), but the original introduction referenced events that would indicate sometime in October 2015! It was also around that time that Robert Lustig came out with a study on NAFLD in children. Lustig has made a comeback in my comments section here of late. He has parlayed a career as a pediatric endocrinologist into a bizarre career as a celebrity doctor/researcher who blames obesity and all evils on one molecule: fructose. I say bizarre because he makes unfounded claim after unfounded claim after unfounded claim as regards fructose. Many of his offerings are backed by the University of California academic "credibility" where seemingly nobody in the sciences he mangles seems willing to vet or speak out against such misinformation. How he transitioned from a hypothalamic-model of obesity to fructose being the singular dietary bad guy is beyond me. But this post was the first in a series looking at such a model to explain "essential" or "ordinary" obesity of the modern day epidemic variety. Lustig has been a go-to expert for a variety of more or less popular schlockumentaries, the most prominent of which might be Fed Up. So now we will be treated to Lustig on film in Tom Fat Head Naughton's latest assault on nutritional science: Fat Head Kids. I can think of nothing more despicable than to lie to children in furtherance of some bizarre agenda. Way to go Tom, you should be ashamed. More on that in a followup to Tom FatHead Naughton's Kooky thermodenyiK Katastrophe. So I'm publishing up this incomplete post in advance of a somewhat detailed discussion of one of the studies. I'd first like to begin with two acronyms and definitions, and then draw some distinctions. I want to make sure that when I use certain terms, there's no confusion. OO = Ordinary Obesity: In the literature this is also referred to as Common Obesity or Essential Obesity. The basic premise here is this is is the obesity that is on the rise globally and seems to hit nations and cultures as they transition to modernity. Hypothalamic obesity is an intractable form of obesity syndrome that was initially described in patients with hypothalamic tumours and surgical damage. However, this definition is now expanded to include obesity developing after a variety of insults, including intracranial infections, infiltrations, trauma, vascular problems and hydrocephalus, in addition to acquired or congenital functional defects in central energy homeostasis in children with the so-called common obesity. Markers of gliosis during early HFD feeding: Activation, recruitment, and proliferation of microglia (macrophage-like immune cells of the brain) and astrocytes, collectively termed “reactive gliosis,” are hallmarks of the brain response to neuronal injury. I highlighted the term response there just to draw a distinction. While this infiltration could result in a morphology that one might term damaged/injured in its own right (e.g. how could the organ or cells function with all that "junk" lying around) these are not neuronal injury per se. Earlier research on high fat diets discussed apoptosis (programmed cell death). I would consider the killing off of functional neurons to be the very definition of damage! I don't mean to nit pick, rather I'm just pointing out the distinctions so there's no confusion. I have to say, that after watching the YouTube video, and how Lustig equipped himself in the face of criticism by Alan Aragon (see comments for Lustig's responses) I found it almost unbelievable that this man had at one time been involved in serious research. So I listened to this podcast with interest and I recall having the heart strings pulled by his descriptions of the children and parents with whom he had worked. I also remember being left wondering just how much real-world relevance there was to the causes and such of ordinary obesity in the general population. If you could find a corollary to the mechanism of HO in OO, then HO becomes an appropriate model for study in OO, in addition to helping those afflicted by it. As I was in the thick of researching the works of Frayn, Hellerstein, Newsholme and others at the time, I couldn't help but wonder how much real relevance HO had to OO in the general population. If you could find a corollary to the mechanism of HO in OO, then HO is an appropriate model to illustrate the causes, and on its face HO seems like it might just be "obesity on steroids". The pathogenetic mechanisms underlying hypothalamic obesity are complex and multifactorial. Weight gain results from damage to the ventromedial hypothalamus, which leads, variously, to hyperphagia, a low-resting metabolic rate; autonomic imbalance; growth hormone-, gonadotropins and thyroid-stimulating hormone deficiency; hypomobility; and insomnia. Understanding the central role of the hypothalamus in the regulation of feeding and energy metabolism will help us gain insights into the pathogenesis and management of common obesity. Fair enough, but it helps to keep in the back of one's mind that there may well be more to this than meets the eye. Even if ordinary obesity is characterized by what appear to be milder forms of the same characteristics of HO, there may NOT be applicable dose-response or cause-effect relationships. Is it a milder form of the same hormonal and physical mechanisms? Or is it something different entirely? Or ... is it somewhere in between ... ? 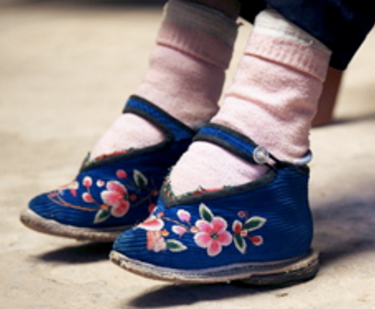 To use my previous analogy, looking at an obese person and presuming it was the result of rare hypothalamic injury would be much like seeing these small feet on an adult Chinese woman (in a population where foot binding was common practice) and presuming it was due to a freak cleaver accident. With one caveat: what about diet induced hypothalamic damage? If it could be established that dietary (or environmental) factors effectively altered the function of the hypothalamus, then the HO model carries more weight. I can surely understand the desire to find such a factor or factors, because it would certainly make treating the condition easier if we could apply the same treatments we do in HO. This by no means implies an easy "cure", but it would put us ahead in the game. NOTE: This next paper, which was grossly "mis-remembered" by Lustig in an interview with Tom Naughton (who didn't bother to verify the outrageous claim) is my main reason for publishing up this unfinished work. This is an older paper -- Bray & Gallagher, 1975 (full text is free by clicking "Article as PDF") -- looking at HO in 8 subjects and comparing it with OO (called essential obesity). The introduction contains a rather extensive review of the literature to date at the time -- over 40 years ago -- including animal studies. It is stated in the text that the primary mechanism leading to the obesity is hyperphagia (overeating!! ), with reduced activity and depressed metabolic rate being of lesser importance. 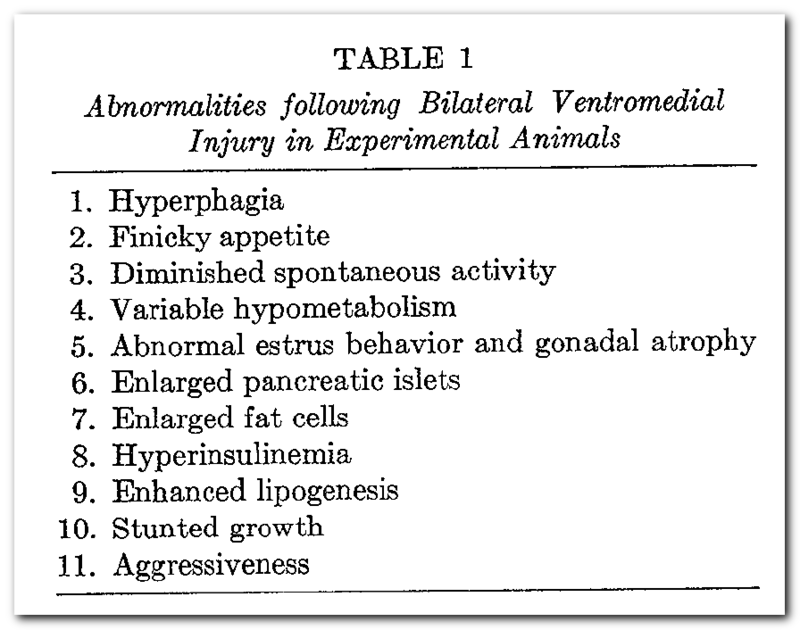 In this 1967 study, lesioned rats were pair fed to insure normal intakes and accumulated more fat. Now this can be interpreted in a number of ways, and if history is any clue, the "alt hyp" folks will do so in the most feasibility challenged manner possible. Some combination of activity and body temperature lowering must occur to lower calories out in order for this to occur. "Internal starvation", a state I imagine is most unpleasant cannot persist forever and would result in body recompositioning towards a rapid death. I can only imagine the torture of a child so afflicted who was denied food when the source of their appetite was unknown. In the end, the obesity of HO results from an energy imbalance, whatever the origins. This, by the way, would be consistent with TWICHOO, as Gary Taubes identifies the carbohydrate as the dietary agent of doom. The key difference is he asserts a direct route from normal postprandial insulin response to hyperinsulinemia to fat trapping obesity, whereas an HO corollary would require hypothalamic damage. TWICHOO could still hold if dietary carb glucose or spikes caused the HIAWO. But this model is also completely consistent with your garden variety energy imbalance model -- or "gluttony and sloth" if you want to appeal to emotion. The main new thing here is that folks are unaware that something is damaging the hypothalamus and throwing it out of whack thus driving overeating and/or sedentary behavior. The characteristics of the resultant obesity, particularly the hormonal milieu, should be largely similar to those seen in confirmed HO. 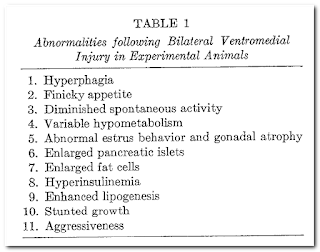 Evidence of hypothalamic damage must precede both the overeating and the weight gain/obesity (and heck, I'll throw in the chronic basal hyperinsulinemia). Herein, I believe, lies the problem, or rather problems, for a hypothalamic damage "switch" model for OO. Furthermore, despite some less-than-stellar statistics, there are numerous people who do successfully reverse their obesity in a wide variety of ways. This should be next to impossible without intervention, and the interventions effective for HO appear to have limited, if any impact on OO. Here's where I left off ... I'm publishing this up as is with hopes to continue on soon.